Want More Energy? Boost your energy and your health! Please note: In late 2016 this product was made unavailable to the public by Isagenix. It has been superseded by Isagenix Replenish. Isagenix Want More Energy product is a fantastic alternative to your typical caffeinated, sugar loaded energy drinks. 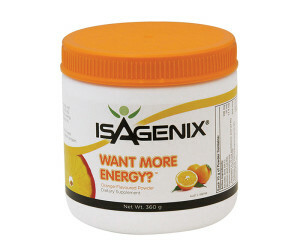 Isagenix What More Energy is infused with A, B and C vitamins to fuel endurance and sustain energy. You no longer will need to rely on caffeine and suffer spikes and crashes, get your energy in a more healthy way. If you’re busy and on the move but lacking the oomph, Isagenix Want More Energy is the solution for you! Another great nutrient filled healthy energy booster option are the Isagenix e+Shot’s, served in convenient mouthful sized shot bottles.